This is the total number of profanity incidents in this 353 page book. 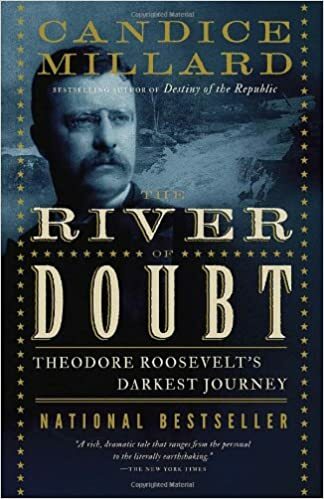 At once an incredible adventure narrative and a penetrating biographical portrait, The River of Doubt is the true story of Theodore Roosevelt’s harrowing exploration of one of the most dangerous rivers on earth. The River of Doubt—it is a black, uncharted tributary of the Amazon that snakes through one of the most treacherous jungles in the world. Indians armed with poison-tipped arrows haunt its shadows; piranhas glide through its waters; boulder-strewn rapids turn the river into a roiling cauldron. After his humiliating election defeat in 1912, Roosevelt set his sights on the most punishing physical challenge he could find, the first descent of an unmapped, rapids-choked tributary of the Amazon. Together with his son Kermit and Brazil’s most famous explorer, Cândido Mariano da Silva Rondon, Roosevelt accomplished a feat so great that many at the time refused to believe it. In the process, he changed the map of the western hemisphere forever. Along the way, Roosevelt and his men faced an unbelievable series of hardships, losing their canoes and supplies to punishing whitewater rapids, and enduring starvation, Indian attack, disease, drowning, and a murder within their own ranks. Three men died, and Roosevelt was brought to the brink of suicide. The River of Doubt brings alive these extraordinary events in a powerful nonfiction narrative thriller that happens to feature one of the most famous Americans who ever lived. From the soaring beauty of the Amazon rain forest to the darkest night of Theodore Roosevelt’s life, here is Candice Millard’s dazzling debut.